Beyerdynamic Amiron review | What Hi-Fi? If we had to choose one word that encapsulates both the design and sound of Beyerdynamic’s Amiron headphones, it would be ‘comfortable’. But good reviews are usually longer, and more insightful than just one word – and the Amirons are talented enough that they’re worth writing about. You’re unlikely to have many complaints about how these headphones feel. 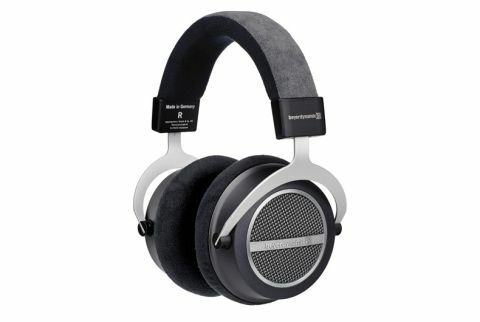 Beyerdynamic has used alcantara microfibres (a blend of polyester and polyurethane with a similar texture to suede) and microvelour to make the earcups and headband. The result is that you could easily wear these headphones for hours on end, and while that may sound like marketing spiel, the Amiron manages to live up to it. These headphones sit on your head easily, without feeling heavy, and the pads around their 45mm drivers give even the largest ears enough space. Connecting the cans to your amp is a 3m long cable, with a 6.3mm jack that unscrews to reveal a 3.5mm connection. As is to be expected from open-back headphones, the Amirons leak sound like a sieve – while the benefit is a larger, more spacious quality to your music, be aware that other people around you will be able to hear it too. And the fact that your music will sound larger is a definite positive for these headphones – their sound quality is superb. Blasting a rock classic, the bagpipes in AC/DC’s It’s A Long Way To The Top (If You Wanna Rock ‘N’ Roll) are a good test of how a pair of headphones can handle treble. The Amiron takes them in its stride, keeping a good grip on the high frequencies without any harshness. On the softer side, the midrange vocals in Fountains of Wayne’s Action Hero come across clearly too, giving an insightful rendition of the way that Chris Collingwood drags and emphasises the ends of his words that the Audio Technica headphones just can’t quite match. There’s also tightness to the Amirons’ timing. The regular high-pitched pips that run in the background throughout the song are kept regular and rhythmic – which is vital when the focus of half the song is on someone hooked up to a heart monitor. And the headphones do a nice job of keeping track of instruments, even during the busier clash of distorted synths, drums, and guitars in Mitski’s Puberty 2 album. Your Best American Girl remains resolutely organised when coming out of the Amirons, building to the climax without losing track of Mitski’s voice and ensuring that stays intact amidst the chaos and feedback. There’s no question that the Amirons can dig down into the lower frequencies either, even without the emphasis on bass that the closed-back headphones have. The growling engine in Queen’s Another One Bites The Dust is solid and detailed when starting up in the middle of the song. While other headphones might sound more energetic, the Amirons don’t force any extra enthusiasm into the song. The dynamism and punch in Queen’s low beats or AC/DC’s power chords comes straight from the music, rather than being hyped up by the headphones. The level of level of transparency and range that these Amirons provide means that, if you put high quality sound into it, you’ll get high quality sound out of it. At this price point, Beyerdynamic’s Amiron headphones provide an impressive sound that takes the whole frequency range in its stride. We like their clear midrange vocals, their tight timing, and the impressive way that they can handle challengingly messy songs. On the whole, the ability of the Amirons will keep you happy no matter what they’re playing.